On the front page of the daily paper, Jagadamard, the headline in Armenian below the banner reads, "An Armenian student kills Talaat Pasha." In July 1919, the Turkish martial court of Constantinople had condemned to death in absentia, among others, the “Three Pashas,” the members of the Young Turk triumvirate that had led the Ottoman Empire during the war: Talaat (Minister of Interior and Great Vizir in 1917-1918), Enver (Minister of War), and Djemal (Minister of Navy). The three had already fled Turkey, and the sentences were never carried out either by Turkey or by the allies. 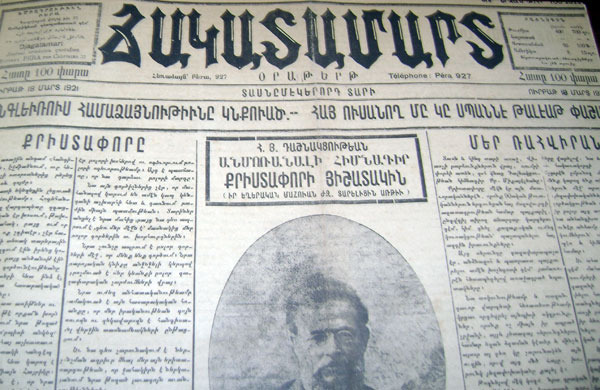 The 9th General Assembly of the Armenian Revolutionary Federation convened in Yerevan, the capital of the Republic of Armenia, between September and October 1919, and adopted a resolution to punish those responsible for the genocide. A list of 200 names was prepared. The secret operation received the code name “Nemesis” (the name of the Greek god of vengeance). It was led by Shahan Natalie (Hagop Der-Hagopian, 1884-1983) and Armen Garo (Bastermadjian, 1873-1923), the latter being the Armenian ambassador to the United States. The number one target of the operation was Talaat, who the U.S. Ambassador Henry Morgenthau had called the “Big Boss” of Turkey and already considered responsible of the extermination in his memoirs. 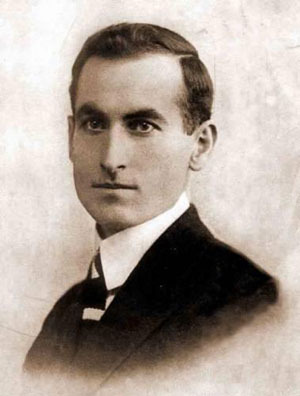 Soghomon Tehlirian (1897-1960), a 23-year-old student who had survived the Armenian Genocide in Erzinga, was selected to execute the mission. Some of the personnel in the Armenian diplomatic mission in Berlin gave logistic support, and other A.R.F. members worked from outside. Once Talaat’s whereabouts were established, Tehlirian arrived in the German capital in December 1920. For the next three months, he carried a surveillance task with his associates. He rented an apartment near the Turkish leader’s house in order to study his everyday movements. Talaat was killed by Tehlirian with a single shot on March 15, 1921, as he came out of his house in the Charlottenburg district. The assassination took place in broad daylight and led to Tehlirian’s immediate arrest by German police. Operation Nemesis, which continued until 1922, went totally unnoticed at the time. The partial story of Talaat’s liquidation was told by Tehlirian in his memoirs, published in 1953. The main details of the operation were not uncovered until the 1980s.